Library for a nomadic wilderness dweller. It would be impossibly expensive and take up too much room in my cabin to buy enough books to last me through even one winter. So rather than sit with my own thoughts, last year I bought a laptop, and a solar panel to power it, and headed to my cabin to be snowed in. I didn’t have a phone then, so I couldn’t connect to the internet, but I stayed happy reading the folowing. : Project Gutenberg DVD This is a free dvd with 9600 books on it, whose copyrights have expired. Most of the books are at least 80 years old but as long as you have power for your laptop you will always have something good to read. You can download it or they will mail it to you. There is also a CD version but with only 600 books on it. Project Gutenberg has 19,000 books at their web page that you can download for free. I have the 2005 deluxe edition: a huge stand alone computer encyclopedia, atlas, and dictionary. Most of the authors that I would read in Project Gutenberg also had entries and often literary guides in Encarta. A search box can be docked on your task bar for handy looking up of words or subjects. I found it really nice to be reading a Project Gutenberg book and coming to a word I didn’t know, copying it and pasting it in the dictionary search bar and getting a definition with the option of also hearing it spoken. Often when I’m reading a paper book and I come to some reference, word or place that I’m not familiar with I just keep reading but with this handy encyclopedia, atlas, and dictionary it’s so easy to look things up. This encyclopedia also has articles from magazines like, National Geographic and Scientific America. In addition to all this it has an extensive history of African Americans; the slave narratives alone will keep you in good reads for weeks. Posted on November 14, 2006 December 23, 2006 Author crowCategories Cabin and Car living, mediaLeave a comment on Library for a nomadic wilderness dweller. 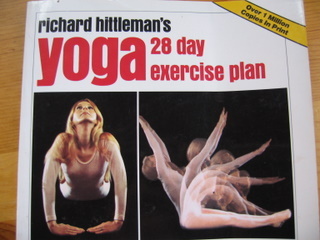 I first heard about Richard Hittleman’s Yoga: 28 Day Exercise Plan from Ray Jardine in Beyond Backpacking . He said that it was one of the things he did to prepare for a long hike. It’s not just a twenty eight day course, it’s a life long yoga program that will make you strong, flexable and healthy. The book is horribly dated; it’s from the seventies, but I can overlook that. I’ve been watching a lot of documentaries lately: There is sequel out to the documentary “The Selling of a Serial Killer” It’s called ” Aileen: Life and Death of a Serial Killer”. It takes the story up to her execution. Sad but a good documentary. I also recommend “Spellbound” a documentary about the national spelling bee.